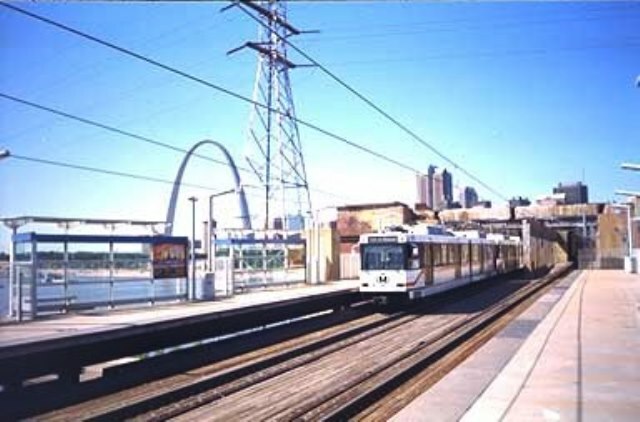 This photo was taken from the East Riverfront MetroLink Station, the first stop as you head east into Illinois. This train still has the original paint scheme. Looking west, you can see that this was before the road deck to the Eads Bridge had been rebuilt. Construction of the new road deck began in 2001, and the Eads Bridge reopened to vehicle traffic on July 4, 2003 – so if you guessed East Riverfront and any year before 2001 or so, congratulations! East Riverfront Station 50 years ago today? Not 50 years ago today but 20 years ago on the opening of the Gateway Arch? You are correct around the time the Metrolink first opened 20 years ago, that’s the EADs bridge in the background to the right of the Arch. However, the Gateway Arch was opened in the sixties, i personally visited it in 1974.